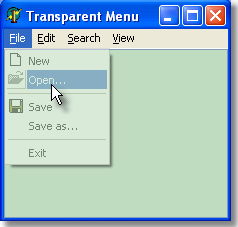 SwissDelphiCenter.ch : ...create transparent menus (2000/XP)? // Use crKey as the transparency color. // Use bAlpha to determine the opacity of the layered window..
// If the import did not succeed, make sure your app can handle it!